If this was season 1, I’d likely be making Mrs. Padmore’s (salty) raspberry meringue or perhaps some Turkish delights? But let’s be honest, I watch the show for Lady Mary. She is my pale complexioned, elitist, English counterpart. And a refined lady deserves a refined dessert. These are my Lady (Mary) Grey Macarons. A delicate French dessert inspired by my favorite tea, Lady Grey. This tea, named after Lady Mary Grey (seriously, this was a real person) is an Earl Grey with hints of orange and lemon. Perfect for afternoon tea! This was my first attempt at making French macarons. I’d been too intimated and terrified to make them before, having heard such horror stories of cracked macarons, overwhipped macarons, underwhipped macarons, mutant macarons. But for this being my first attempt, I think they turned out pretty well and were not nearly as hard to make as I thought. Macarons are perhaps my favorite dessert and I loved the texture and flavor of these cookies– the floral Earl Grey with the fragrant citrus was honestly di-vine. 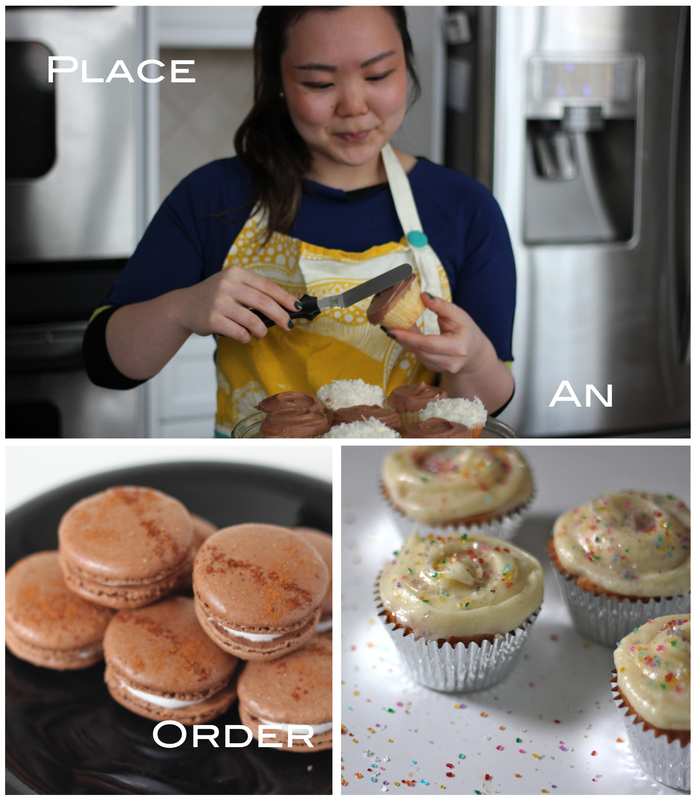 I will be utilizing this macaron recipe as a base for all other variations in the future. Essentially, the difficulty in making macarons is that they are composed of only a few, simple ingredients that must be handled very precisely. Almond flour, egg white, sugar, water. That’s all you need to make the cookie parts. That’s why it’s so important to get the best, freshest ingredients. And I’m sorry to have to say this, but you’re gonna need a scale (and thermometer) for this recipe. I wouldn’t trust myself to make this recipe without one. They’re like $10 and don’t take up much space… a pretty worthy investment if you’re crazy enough to make macarons in the first place! I really liked the look of the speckled tea leaves in the macaron cookies. The tea I used was extremely fresh (my sweet coworker Christina got me a cannister on her recent trip to London) but if you decide to use crushed leaves from tea bags that’s fine too, just don’t be afraid to amp up the flavor! The filling was something I came up with on-the-fly. I wanted something very light but super smooth and luxurious. Since Lady Grey tea gets its distinction from the flavors of orange and lemon peel, I wanted to incorporate this into the macaron without overpowering it. Curd is one of my favorite things. I could/do eat it straight out of the container with a spoon. So a curd filling made from the zest and juice of orange and lemon seemed like the way to go. Mixed with some (more) butter and powdered sugar, it was really the ideal companion to the Earl Grey. It’s alright– chin up! Here’s to the weekend. And to Lady Grey macarons. (1) Because the cookies will be sandwiched, it is important that they be as close in size as possible. Even if you are proficient with a pastry bag, we suggest making a template, as we do. Use a compass or a cookie cutter as a guide and a dark marking pen, such as a fine-tip Sharpie. Lay a sheet of parchment paper on the work surface with a long side closest to you. Trace 5 even spaced 1½-inch circles along the top long edge, leaving 1 inch of space around them. Trace 4 circles below them, spacing them between the first circles. Continue with another row of 4, followed by another row of 3. Turn the parchment over and lay it on a sheet pan. Lift up each corner of the parchment and spray the underside with nonstick spray to keep it from blowing up while the cookies are baking. Repeat with a second sheet pan and piece of parchment paper. (2) Preheat the oven to 350°F. (3) Place the almond flour in a food processor and pulse to grind it as fine as possible. Sift the almond flour and powdered sugar into a large bowl and whisk together. (4) Mound the almond flour mixture, then make a 4-inch well in the center, leaving a layer of the flour at the bottom. Pour in the 82 grams egg whites and combine with a spatula. Add the tea grounds to the mixture, stirring until evenly distributed. Set aside. (5) Place the remaining 90 grams egg whites in the bowl of a stand mixer fitted with the whisk attachment. (6) Combine the 236 grams granulated sugar and the water in a small sauce pan and heat over medium-high until the syrup reaches 203°F/110°C. (7) Letting the syrup continue to cook, add the pinch of sugar to the egg whites, turn the mixer to medium speed, and whip to soft peaks. If the whites reach soft peaks before the syrup reaches 248°F/120°C, reduce the speed to the lowest setting, just to keep them moving. (8) When the syrup reaches 248°F/120°C, remove the pan from the heat. Turn the mixer to medium-low speed, and slowly add the syrup, pouring it between the side of the bowl and the whisk; the meringue will deflate. (9) Increase the speed to medium and whip for 5 minutes, or until the whites hold stiff, glossy peaks. Although the bowl will still be warm to the touch, the meringue should have cooled; if not, continue to whip until it is cool. (10) Fold one-third of the meringue into the almond mixture, then continue adding the whites a little at a time (you may not use them all) until when you fold a portion of the batter over on itself, the “ribbon” slowly moves. The mixture shouldn’t be so stiff that it holds its shape without moving at all, but it shouldn’t be so loose that it dissolves into itself and doesn’t maintain the ribbon; it is better for the mixture to be slightly stiff than too loose. (11) Transfer the mixture to the pastry bag with the ½-inch tip. Hold the bag upright ½ inch above the center of one of the traced circles and pipe out enough of the mixture to fill in the circle. Lift away the pastry bag and fill the remaining circles on the first pan. Lift up the sheet pan and tap the bottom of the pan to spread the batter evenly and smooth any peaks left by the pastry bag. (12) Place the sheet pan in the oven, immediately lower the oven temperature to 325°F, and bake for 9 to 12 minutes, until the tops are shiny and crisp. Set the pan on a cooling rack and cool completely. If using a standard oven, preheat it to 350°F again. (13) Pipe the remaining meringue mixture into the circles on the second sheet pan. Feel free to decorate these halves with some sprinklings of more tea grounds. Bake as directed above. Let cool completely. (14) To fill the cookies, transfer the orange lemon buttercream to the pastry bag with the ½-inch tip. Remove the macarons from the parchment paper. Turn half of them over. Starting in the center, pipe about 2 teaspoons of the buttercream in a spiral pattern on one upside-down macaron, not quite reaching the edges. Top with a second macaron and press gently to spread the buttercream to the edges. Repeat with the remaining macarons and filling. The macarons are best if wrapped individually in a few layers of plastic wrap and frozen for at least 24 hours or up to 2 weeks. Defrost in the refrigerator for 3 hours, then bring to room temperature before serving. They can be served the day they are made or stored in a covered container in the refrigerator for up to 2 days. (2) Turn the mixer to low and add the orange-lemon curd. Continue to beat for another 2-3 minutes. Set aside until ready to fill cookies. (1) In a small saucepan, whisk together egg yolk and egg until combined. While whisking, pour in sugar, lemon and orange juice, and zests, and continue whisking until creamy and well incorporated, about one minute. (2) Place over medium heat, whisking constantly, until the custard thickens and can coat the back of a wooden spoon, about 8-10 minutes. (3) Remove the pan from the heat, and stir in the butter, one cube at a time. Strain into a bowl or jar, cover surface with plastic wrap and chill in the refrigerator for at least one hour. Excited to make your Thanksgiving treats– only wish I could enjoy them with you!